Below you'll find a summary of the questions we are asked most frequently by our customers. If you have a question that is not listed here and would like to speak to a wildlife technician about your problem, please contact us. 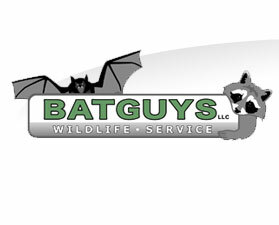 Because bats are such a big part of our business, we've given them their own page of Bat FAQs. Animal Removal: What do you do with the animals that are caught? The animals we catch are usually released on-site. In certain situations some animals must be euthanized according to state law. Please visit our humane wildlife removal page for more information on this subject. Getting Rid of Squirrels: I see a hole in my roof that the squirrels are using to get into the attic. Should I go up there and block it up? No. If you block up a squirrel hole they will either chew around the patch, creating more damage, or if you do a good job of the sealing the hole they will be trapped in your attick and will chew their way down into your living room. We have a safe and effective process that we use for removing squirrels from house, which is explained on our squirrel removal page. Getting Rid of Skunks: I have skunks living under my house/shed, and I see the hole that they're using. Should I block it up? No. Two things can happen if you block a skunk's entry point: They will either dig around the blocked hole, creating more damage, or they will be trapped under the house or shed and die right there. If you thought you had a problem when you had live skunks, you'll have twice the problem when you have dead skunks under the building. If the carcass can't be removed you may end up with months of unpleasant odors, flies and maggots. A live skunk is much cheaper to remove than a dead skunk. See our skunk removal page for more information. The responsible answer is no. By using mothballs in an effort to keep animals away you are using a chemical in a manner that is inconsistent with its labeling, and that is against the law. By spreading mothballs throughout your attic or fireplace to drive out an animal you are actually creating a toxic environment. Fumes from mothballs are very hazardous to humans, and this creates a great danger to people livingin the house. We strongly advise that you should not use mothballs in an attempt to keep animals away. Getting Rid of Raccoons: I have a family of raccoons living in my chimney. Can I light a fire to scare them away? You should not light a fire to scare the raccoons away. Raccoons use chimneys as places to give birth to their young. Lighting a fire in a fireplace under an adult female raccoon and her four or five pups is a very bad idea. Not only is it extremely dangerous, but it's also inhumane and would be considered cruelty to animals. See our raccoon removal services page for more information. Getting Rid of Coyotes: I have seen a coyote in my neighborhood several times. Can you come trap it? We are licensed nuisance wildlife operators, but we are not permitted by the state to trap coyotes. Wildlife Removal Pricing: What are your prices? How much do you charge for removing animals? Our prices vary greatly from one job to the next. In most cases the size and condition of the house are what determines the price of a job. We find that no two houses are alike and no two houses ever have the same amount of animal damage. Each situation we encounter is truly unique. For this reason we cannot have set rates for our services. One squirrel removal project with one entry point that is fairly simple may cost $100, while the same job on the same house with 5 entry points will cost twice as much. For this reason, we will conduct an inspection before we write a quote for an animal removal project. We have been told by our customers on many occasions that are rates are very competitive. Do you handle domestic animals, such as dogs, cats, ferrets or lizards? No. Our licensing only permits us to handle wildlife. for matter sother than wild animals you should contact your locality's animal control officer. Squirrel Control: Do my bird feeders attract squirrels to my yard? Yes, they do. If you've had problems with squirrels in the past we recommend removing bird feeders to keep the squirrels away from your house. See our squirrel removal page for more information. Skunk Control: I saw a skunk walking through my yard last night. Will you come trap it? No, in most cases we won't. The reason for this policy is that there are skunks everywhere in our area. In any given neighborhood there are dozens of skunks. These skunks will walk through your yard on occasion and they will not bother you if you leave them alone. In most cases we could come out and trap and remove one skunk, but you would have one of its relatives in your yard the very next night. Trapping and removing one animal doesn't accomplish anything. If the animal is not doing any damage, we suggest that you leave it alone, or better yet enjoy the skunk! Bring the kids to the window and show them. Shine the flashlight on it and show the kids how the skunk forages for food. They're very interesting animals. If the skunk gets under the house or takes up residence under your porch, then call us. Raccoon Control: I have seen a raccoon on my roof. Does that mean that they're in my chimney or attic? In most cases, yes. If a raccoon was on your roof, it was up there for a reason. In nearly every call we respond to regarding a raccoon on the roof, we end up finding a family of raccons in the attic or the chimney. Woodpecker Control: I have a woodpecker that is tearing my house apart! Can you help? Sometimes. Woodpeckers are federally protected. There is a long, tedious process one must go through to remove a woodpecker. Contact BatGuys for more information. Pigeon Control: We have pigeons all over our roof and the droppings are making a mess. Is there any hope for this situation? Sometimes. In certain situations we can utilize pigeon netting and other bird control products to provide a solution to these problems. We do most of our pigeon control in Boston, where the pigeon populations are highest. The first step in the process is conducting an inspection of the premises. Once this is done we can propose a solution. Please contact us for further information.